Achievement Unlocked: Google AlphaGo A.I. Wins Go Series, 4-1 : The Two-Way A top world Go champ lost the last of five games against Google's AlphaGo. But both sides are going home from the match with a lot more to learn. South Korean professional Go player Lee Sedol reviews the match with other professional Go players after the fourth match against Google's artificial intelligence program, AlphaGo. Going, Going, Gone: Master Go Player Loses Best-Of-5 Match With A.I. 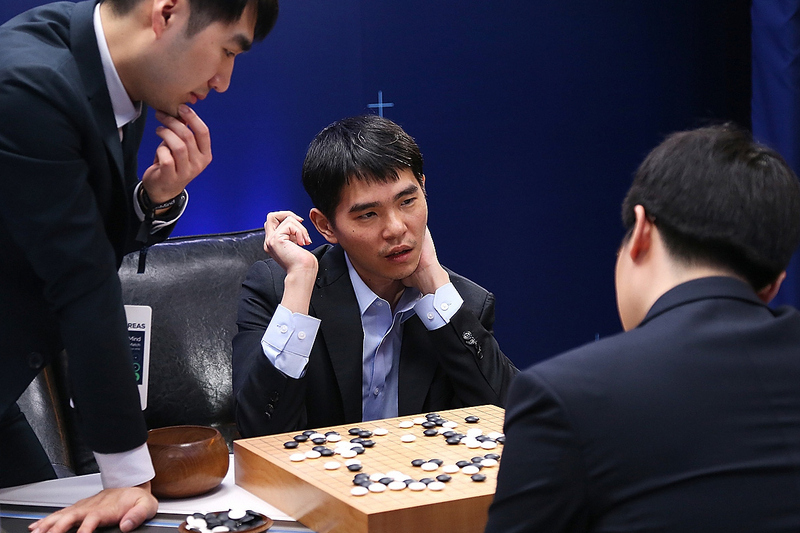 The five-game clash pitting man against machine is over, with Google's artificial intelligence program winning the series.The program — called AlphaGo — took four of five games against Korean Lee Sedol, an 18-time world champion of the board game Go. "I feel a little regrettable because I believe that there is more that a human being could have shown in a match against artificial intelligence," Lee said following the final match. The matchup had all the mood and atmosphere of a prize fight. A ritzy hotel venue. Enough cameras flashing to temporarily blind you. And play-by-play announcers who analyzed every move. Of course, in this case, the analysis consisted of discussing strategy while duplicating a board of black and white stones for hours on end. Go is an ancient East Asian board game played with stones on a 19 by 19 board that has long enjoyed popularity in Asia, but has, in the past week of publicity, been introduced to many new corners of the world. "This is definitely the moment when we realized computers could beat us at this game," says Andrew Okun, the president of the American Go Association. Google subsidiary DeepMind's artificial intelligence program AlphaGo has been in the works for the past two years. It relied on machine learning and neural networks to study a database of 100,000 human matches, then played against itself millions of times to reprogram itself and improve. "Go has been an outstanding grand challenge of AI research for at least the last twenty years," says Demis Hassabis, who heads DeepMind. A computer had already beaten a human champion at chess decades ago. But Go has more possible moves than there are atoms in the universe, so it was considered a far more intuitive game for a machine to try and beat. "So it's really kind of the Mount Everest of perfect information and games," Hassabis said. For an adversary, "We wanted to pick somebody who, in twenty to thirty years time, would still be remembered as a legend of the game." The challenge riveted South Korea. At Seoul's central train station, we found hundreds huddled around a television to watch the matches. One of them was Lee Song-hee, who has no relation to the player. "I'm just burning up inside," she said as she watched the final match. "It's like watching my own son play the game. It's like watching my family." With all eyes on him, Lee lost the first three games to AlphaGo. The losses stunned him, he said. Lee then fought back to defeat the computer once, on Sunday. And after battling it out for every point, Lee ultimately lost the final game, deep in overtime. So far, Okun says the reaction to this moment is mixed. Not unlike a lot of other reactions to tech innovation. "Fifty percent sadness and trepidation and 50 percent where can I get my copy? I want this software," Okun says. AlphaGo's makers don't plan to sell it commercially just yet. But already, it's challenging 2,500 years of traditional Go strategies and thought. "All the traditional or classical beliefs we have had about Go so far, I have come to question them a little bit based on my experience with AlphaGo," Lee said. "So I think I have more studying to do down the road." In its historic win over a man, the machine has something to teach — new perspectives on an ancient game. Haeryun Kang contributed reporting to this story.